← Be informed. Be active. 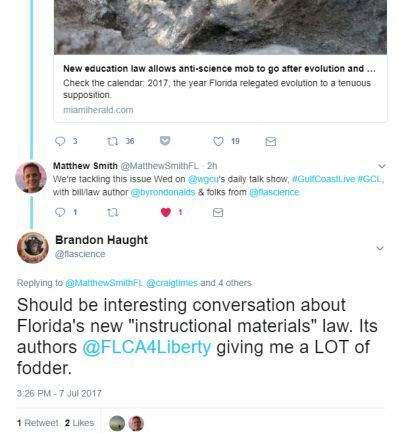 Florida’s horrible new Instructional Materials and Religious Liberties in Schools laws are continuing to garner all sorts of news coverage. The latest pieces are great takes on the laws by popular columnists. 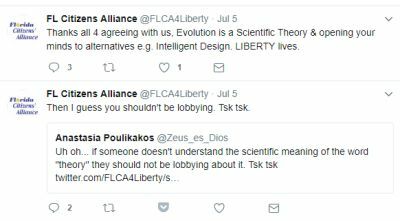 Check the calendar: 2017, the year Florida relegated evolution to a tenuous supposition. Some 92 years after a substitute high school teacher named John T. Snopes stood trial for exposing students to Darwin’s theory of evolution through natural selection, Florida intends to force local school boards to re-litigate the old conflict between religious fundamentalism and modern science. Last month, Gov. Rick Scott signed a bill that will allow any county resident to challenge public school teaching materials they personally find unsuitable, inappropriate or pornographic. The law requires school boards to hire hearing officers to deal with complaints. So my cousin’s nephew’s best friend’s daughter tells me there’s nothing about Noah’s Ark in her public school textbook for Earth Science. How can this be? Instead of filling these kids’ minds with nonsense about sedimentary rocks from billions of years ago (when we know the earth is only 6,000 years old!) they should be taught how they’re all here today because the 600-year-old Noah loaded all the animals two-by-two on his big ark, and thereby preserved life on Earth. Which is why me and the others in the prayer circle are planning to show up for the public hearing we are entitled to under the new Instructional Materials Act passed by legislature. I want to leave you with this final thought: these folks WON. They got their law passed. I’m sorry … this isn’t funny … it’s just plain sad. This entry was posted in Instructional Materials bills '17, Religious Liberties Act 2017. Bookmark the permalink.